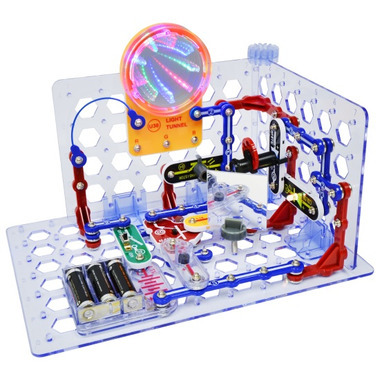 Award winning Snap Circuits offer children an exciting, hands-on introduction to electronics! With colourful and easy to follow pictorial instructions in the Snap Circuits manuals, kids will have hours of fun experimenting with electricity and building amazing electronic devices. 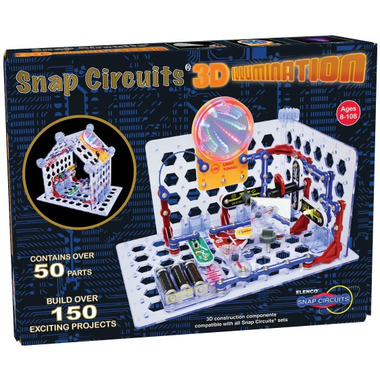 Take Snap Circuits into a new dimension with new Snap Modules allowing you to build your circuits horizontally, vertically and upside down. Build over 150 projects using 10 NEW Snap Modules. Snap Modules snap together to ensure correct connections - No Soldering - No Tools - It's a Snap. Build over 150 exciting projects. Warning Choking Hazard - Small parts. Toy contains a cord. Not for Children under 3 yrs.